The 30th Annual SO/LIC Symposium & Exhibition will be held from 5th February 2019 to 7th February 2019 at Hyatt Regency Crystal City in Arlington, Virginia. The complexity of modern global conflict will require the United States Special Operations Command (USSOCOM) to engage in extensive joint, combined and interagency operations to achieve national military and strategic objectives. USSOCOM must now leverage emerging and innovative technologies as never before to link and share information with allies, U.S. Intelligence community members and interagency law enforcement partners as well as an array of disparate players to rapidly understand and exploit adversaries’ weaknesses on the global commons. No longer is conflict confined simply to the battlefield, it reaches instantaneously from the conflict zone to our boardrooms, our communities, and even to our children’s playgrounds. To meet this threat, we require a new paradigm in which U.S. and international law enforcement, intelligence organizations, and Special Operations Forces (SOF) become one unified force; networked and connected as never before. 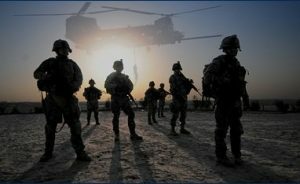 As SOF become more lethal to the enemy, they must leverage and potentially add what may have been traditionally viewed as law enforcement techniques, tactics, and procedures to their skill sets. Achieving this demands American industry actively engage with the SOF and special law enforcement communities to anticipate their needs creating a collaborative innovative eco-system where ideas are nurtured and developed to give our operators all they need to dominate this global struggle. The goal of the NDIA SO/LIC Board, through the annual symposium, is to stimulate and arbitrate this conversation leading to a closer and more collaborative relationship with USSOCOM. The symposium is not only an industry event but a community event where current, former and future operators can meet with innovators to shape the ideas and technology of the future. Click here for the agenda or visit the event website to register. For more information contact Trish Wildt or Macon Field.